Once again I found odd bathroom signage on the road when I visited Cape May. Being someone who likes to defy authority, I did change a shirt in this bathroom. Sh, don't tell. 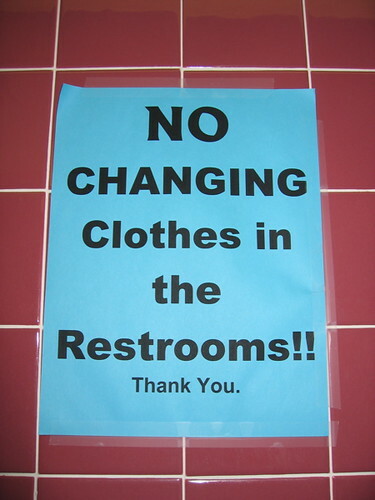 I wonder how the whole restroom society falls apart if people are changing clothes in a restroom? 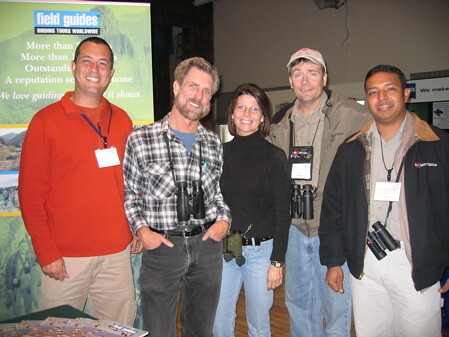 Some of my friends from left to right: Alvaro Jaramillo (who gave some great insight about the western veery in August) he was working a booth for Field Guides, Kenn Kaufman (field guide author and all around good egg), Kimberly Kaufman an Ohio naturalist hanging with Kenn for some reason , Jeff Bouton working the Leica booth, and Carlos 'Hawk Eyes' Bethancourt of Canopy Tower. One of the really cool things that happened after I finished my time at Eagle Optics was getting work from my friends. It's been really fun and a whole new world of job possibilities has been opened up for me. 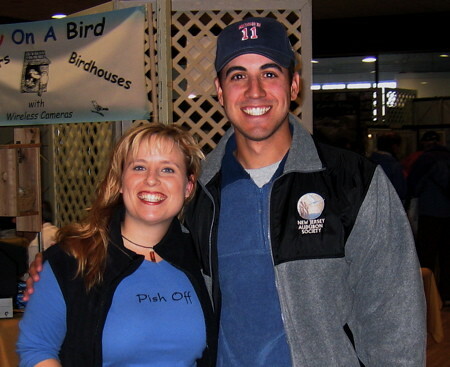 One of them has been with Bart Stephens at WingScapes (and it takes everything I have not to call him Bart Simpson). He's a birder (although I don't know if he would call himself that) who WildBird on the Fly and I have gotten to know by running into him at different festivals in the last year. He's been channeling his interest in birds into a new product that his company made. When I talked to him in September he asked if I would be willing to give him an extra set hands at booths and oh, would I mind coming with him to Cape May, NJ? Working with a friend and going to a bird hot spot--that was a tough call--NOT! Bart's a very laid back birder, and I got a kick out of visiting his home in Alabama and he had red-headed woodpeckers coming to his deck feeders--he was very relaxed about that, even as I freaked out with excitement. Also, his deck is elevated and we watched a red-tailed hawk thermalize right off of it--how we got any work accomplished, I will never know. We'll be hearing more about him and WingScapes in the coming weeks. 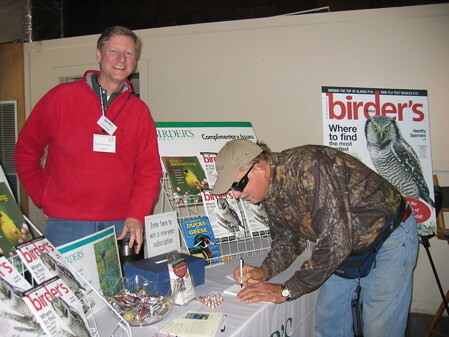 At Cape May I helped Bart conduct surveys at a booth to get an idea of what people know about bird feeder cameras. We had a lot of fun and filled out a ton of surveys. I kept noticing this cute blond and I kept thinking that I know her from somewhere. I also noticed that she kept looking at me too. I worried that I met her at a previous festival and it had escaped my mind. She came over and introduced herself, it was Somewhere in New Jersey (aka Laura). That was fun to say hi to her, I knew she lived in Cape May and was glad to have a chance to connect. 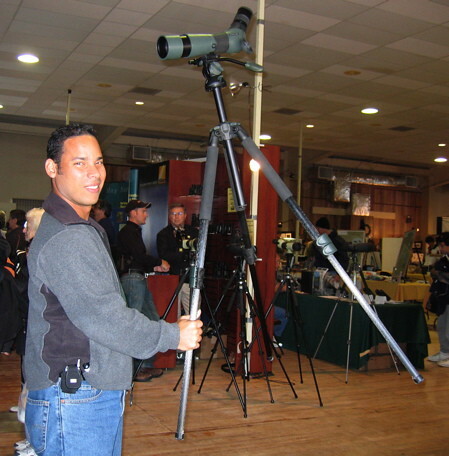 Above we have one of the Swarovski reps demonstrating how light their new tripod is. I even lifted it myself, very light weight. This blogger I recognized right away from his photo--that smile gives him away. It's Patrick Belardo (aka Hawk Owl's Nest)--who was quick to point out that he had nothing to do with the server crash last weekend--guilty conscious, Patrick? Eeep! Angry Chuck! I love Chuck, he's got a great sense of humor and I wish I could run into him more often. 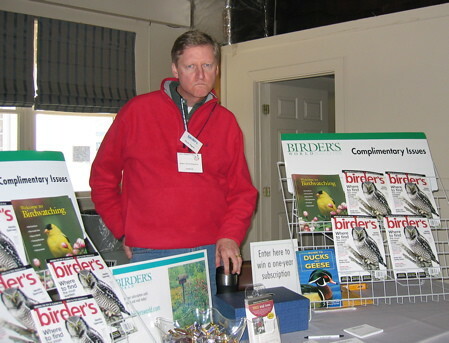 Word on the convention room floor was that the Birder's World booth had the best candy, so if you go to a bird fest and BW is there, go for the candy, stay for the magazine. Here's Taryn, a publicist for Houghton Mifflin rockin' a really wicked bad dragonfly face painting. She helps keep me informed of all the cool bird books they have coming out. You will note the book that's not fully in the picture called All Thing Reconsidered--that a certain Bill of the Birds edited. There were a few other intriguing booths at the trade show. One is something being developed called iFieldGuides which is supposed to take the Stokes' CDs and organize them on your iPod similar to BirdPod but will also have photos for all the species as well as a listing feature. It's also going to be cheaper. It's not ready yet, but it's interesting watching technology playing out in the birding field. Where will it go next? There are more and more nature photographers popping up out there with boothes to sell their stuff. I have heard some of my professional nature photographer friends grumbling that anyone with a camera (or digiscoping set up) thinks they can call themselves a professional nature photographer. I didn't really get what they complaining about until now. A photographer had a booth and had quite a few photos displayed that you could purchase as frameable prints or cards, but what first caught my eye were the number of prints for sale where the bird wasn't entirely in focus. I tried to give the photographer the benefit of the doubt--maybe they were being arty...then I found the photo that just really shouted "I don't know quite yet what I'm doing." The photo was of a warbler sitting on concrete. It was an up close shot and I thought, well during migration you can see exhausted migrants. It wouldn't be my first choice for a background to a bird but if you didn't know birds all that well it was an up close shot of a cute yellow bird--then you saw it: a twisted foot out to the side. There were a couple of different prints at different angles of the same bird and yessirree bob, the bird's foot is off to the side and twisted upwards. 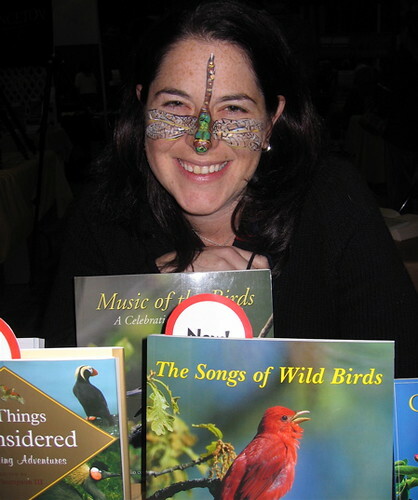 I just had an image of a birder getting a birthday card in the mail from their mom who didn't know birds well and wondering, "Why did mom send me a card of an injured bird for my birthday?"